While not officially a part of Alcoholics Anonymous in any way, the chip system is used throughout the country, and throughout the world for that matter, to commemorate special milestones in recovery. Various medallions are used to signify and mark varying lengths of abstinence from alcohol. These special tokens, usually about the size of a poker chip, are often given to those in recovery by their home group, sponsors (spiritual mentors), or even special friends or family members. Their intent is both to celebrate the accomplishment and to remind the recipient of their daily commitment to their personal recovery. While nearly impossible to pinpoint the precise genesis of the chip system, it is commonly believed to have begun in Indianapolis in 1942. A.A. was brought to Indianapolis in the early 1940's by Doherty S. In a letter to Bill W. (Alcoholics Anonymous co-founder), Doherty makes reference to giving out "chips" and "tokens." There is evidence, too, that Sister Ignatia in Akron, OH used medallions. 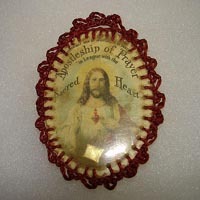 Working at St. Thomas Hospital, "Sister Ignatia gave each of her newly released patients a Sacred Heart medallion, which she asked them to return before they took the first drink. She would occasionally give out St. Christopher medals as well…” (Dr. Bob and the Good Old Timers - page 195). By accepting these medallions, these newly recovering Alcoholics were signifying their commitment to God, to A.A., and to recovery. It was understood that if they intended to drink, they had a responsibility to return the medallion to her before drinking. Needless to say, it's not the medallions themselves that keep recovering individuals sober. The importance is in the meaning behind the tokens. 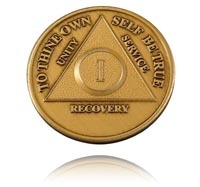 As those in recovery receive special tokens for one month, then two, then three months, and so on - the medallions generate a sense of pride for fulfilling their commitment to their recovery. Often a simple glance at a special token can provide motivation to continue to remain abstinent even when the thought of drinking arises. Jokingly, many "old-timers" have said to those new in recovery, "should the thought or desire to drink occur, place the medallion in your mouth. Once it dissolves, it's then safe to take the drink." 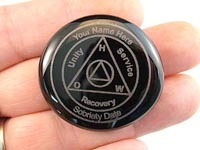 It is now common for A.A. groups (and many other 12 step based recovery groups) to offer some type of medallion or special token to members celebrating achievements in their recovery. In addition to the now common Bronze AA Medallion; plastic chips, wooden AA tokens, glass pocket gems, leather medallions, keychains, coffee mugs, and wristbands are becoming more and more popular, too! There is even a tale of a group that offers a bullet for the recovering alcoholic to carry around so that if the thought of drinking comes up, the alcoholic will have a bullet handy for "the easier softer way out." While the A.A. chip system is of major importance to many, it represents but a small part of what is offered by Alcoholics Anonymous and those fellowships modeled after its 12 step program of recovery. The life saving program and its “nearly miraculous” success rate is attributed, in part, to the power of one alcoholic helping another. "Alcoholics Anonymous is a fellowship of men and women who share their experience, strength and hope with each other that they may solve their common problem and help others to recover from alcoholism. The only requirement for membership is a desire to stop drinking. There are no dues or fees for AA membership; we are self-supporting through our own contributions. AA is not allied with any sect, denomination, politics, organization or institution; does not wish to engage in any controversy, neither endorses nor opposes any causes. Our primary purpose is to stay sober and help other alcoholics to achieve sobriety." Copyright © by The A.A. Grapevine, Inc.